This is a weird one. It’s the day of the dead in Mexico City and there’s 5 skeletons with painted faces playing different instruments in some sort of undead mariachi band. These skeletons also have 3 skulls balanced on top of their own cavernous brains. It’s not until you press spin that you realise that these bony creatures make up the reels of this online slot. Spin today and match the skulls to earn yourself some spicy Mexican rewards. Thunderkick hit the gaming scene in 2012 with the simple idea to create games that enhance the overall player experience of online casinos. Today they are live on hundreds of sites and are never afraid to undertake new opportunities. When you win, heads will roll - literally! 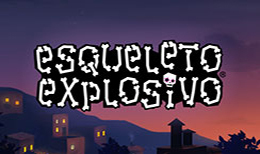 Inspired by the Mexican celebration Day of The Dead during which Mexicans celebrate and remember past loved ones, Esqueleto Explosivo means exploding skeleton. This is a slot of mucho explosions and exlplosivo wilds! There are 17 win lines and 5 reels... Sort of. Instead of regular slot reels, Esqueleto Explosivo has rows of brightly coloured skulls. Don’t get scared, it’s good fun! Meet, Enrico Mortis and his mariachi band The Boners. (pause for laughs) Along the bottom are five skeleton bodies, each holding different instruments. Atop each is three skulls, complete with blinking, moving eyes! Fifteen skulls in all. As you play, the skulls fall away and new lines drop with a satisfying ‘plop!’ Each skull is colourfully decorated and suggest different characters for each with missing teeth, moustaches the lot. The main play reels sit against a Mexican themed, dimly lit street. Look closely and you can see a table behind the band covered with pictures of their past on loved ones and candles. A jolly Mariachi soundtrack, punctured with the distant sound of exploding fireworks and a cheering crowd really make this a lively, feast for the eyes and ears when they sing. Yep that’s right, land a winning combo and you will get a quick blast from each member of the combo and your win total appears by them - the final total appears panel centre and the instruments animate. Told you it was fun! Esqueleto Explosivo may be minus a free spins feature, but there is so much happening and more to watch for that it is forgiven. The play moves smoothly and quickly with dropping symbols and Explosivo wilds and thanks to the Mucho multiplier the wins can be ...well, explosivo! On landing a winning combo, you trigger the dropping symbol feature where the skulls from the winning bet line will fall away and the symbols above will drop into their place and a second win combo can appear. You can quickly rack up the coin amount and line up wins containing dropping symbols and the multiplier will increase. The multiplier values are at the bottom of the reel panel beginning a 1x and climbing to a tidy 32x. The multiplier can increase with the appearance of the Explosivo Wild! This wild lives up to its name and it will blow up 8 of the nearest skulls where ever it lands. This creates ample space for more symbols to fall into place and create further possible wins. The multiplier is increased by 1 on each win. The layout is simple and info panels keep you informed of your bet and win and credit. You can toggle the sound and a menu style panel offers rules and info on the game. Click on the chip and you can choose your bet size from a panel of set amounts beginning at 0.10 to 100. Esqueleto Explosivo comes via Thunderkick. Noted for their lush productions, this slot is no exception. The graphics are first rate and the animations are superb from firework lights to singing skulls, this one is a winner! This is a very clever slot that offers something a little different. It has a very slick, rapid play that is loaded with nice touches and fun. The bet range is suitable for all pocket sizes and it should quickly find a huge audience of players that appreciate excellent production and style. Check it out!